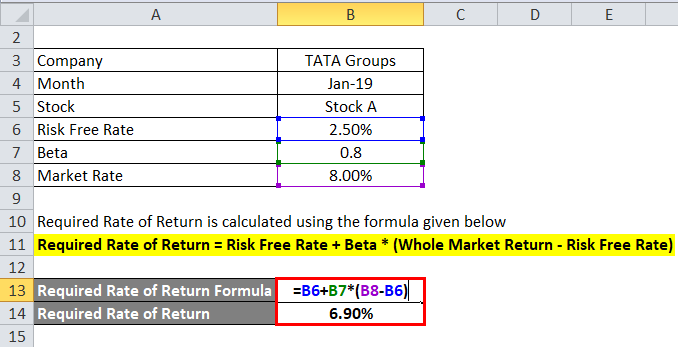 Let’s take an example to understand the calculation of the Required Rate of Return formula in a better manner. Here is an example to calculate the required rate of return for an investor to invest in a company called XY Limited which is a food processing company. Let us assume the beta value is 1.30. The risk free rate is 5%. The whole market return is 7%. For this model consider XY Limited is paying dividends of Rs.140 per stock. The dividend growth rate is 7%. The current stock price is RS.200. Let us take the real-life example of Tata Group of company with the following information available. CAPM: Here is the step by step approach for calculating Required Return. 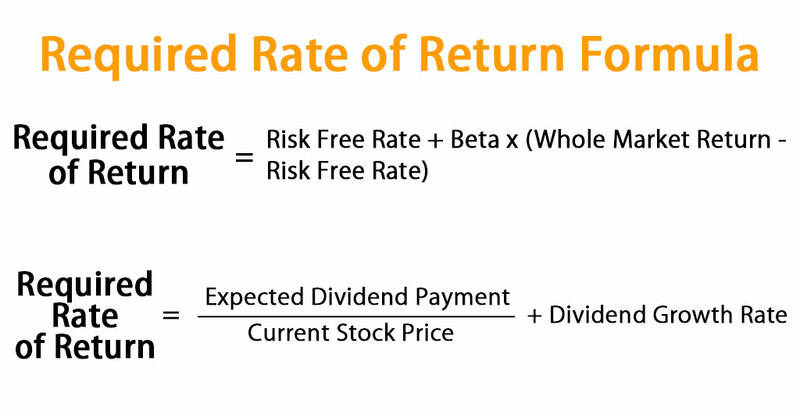 Step 1: Theoretically RFR is risk free return is the interest rate what an investor expects with zero Risk. Practically any investments you take, it at least carries a low risk so it is not possible with zero risk rate. In India, the government 10 years bond interest rate is around 6% (least Risk rate) can be taken for this benchmark. Step 2: β is the Beta coefficient value of Stocks which is the measure of the volatility in comparison to the market or benchmark. It is the tendency of a return to respond to swing in the market. That is how much risk investment will add to the portfolio in the market. This can be computed by dividing the covariance of the Asset and Market return’s product by the product of the variance of the Market. Good Beta value is 1 as per the standard index. Beta with lesser than 1 has a low risk as well as low returns. A beta value greater than 1 has a high risk and high yield. Step 3: Whole Market Return is the return expected from the market. You can get the market return by searching in the net or you can refer the standard index such as NIFTY 50 index. 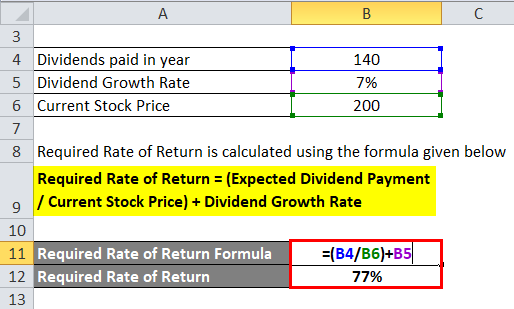 Step 4: Finally, the Required rate of return is got by applying the values which were forecasted as shown below. 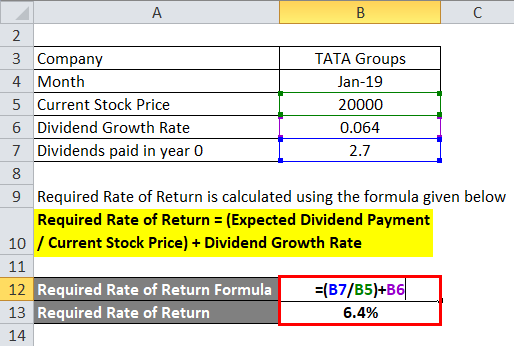 Dividend Discount Model: On the other hand, the following steps help in calculating the required rate of return by using the alternate method. This model is only applicable when a company has a stable dividend per stock rate. Step 1: Firstly, the Expected dividend payment is the payment expected to be paid next year. Step 2: Current stock price. If you are using the newly issued common stock, you will have to minus the floating costs from it. Step 3: The Growth rate of the dividend is the stable dividend rate a company has over a period of time. 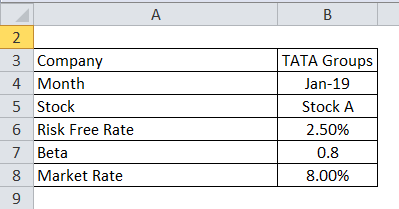 Step 4: Finally, the required rate of return is calculated by applying these values in the below formula. The required rate of return formula is a key term in equity and corporate finance. Investment decisions are not only limited to Share markets. Whenever the money is invested in a business or for business expansion, an analyst looks at the minimum return expected for taking the risks. These decisions are the core reasons for multiple investments. So it calculates the present dividend income value while evaluating stocks. As well as, it calculates the present free cash flow into equity. For capital projects, it helps to determine whether to pursue one project versus another or not. It is the minimum return amount, an investor considers acceptable with respect to its capital cost, inflation, and yield on other projects. You can use the following Required Rate of Return Calculator.